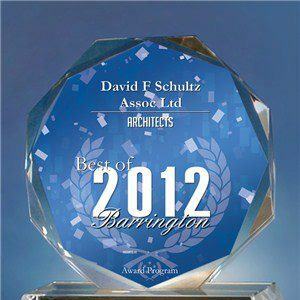 David Schultz, AIA, NCARB, LEED is the principal architect at David F. Schultz Associates Ltd. in Barrington, IL. 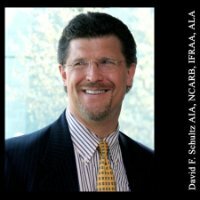 David F. Schultz Associates was founded in 1986 and specializes in the design of churches, preschools, parochial schools and other facilities for church-based ministries. David’s firm has designed more than 372 facilities over the past 26 years. I always wanted to be an architect. I constantly played with blocks, made huge towns out of them that would wind throughout our house. I built tree houses in my backyard. Some kids got into trouble for chewing gum or passing notes during class – I got into trouble for sketching buildings in my notebooks when I should have been paying attention to the teacher. I still have a notebook of “gravity-defying” buildings I designed in 4th and 5th grade. I’m grateful my parents encouraged my interest in architecture. They had hoped I would become a Pastor, but they never pushed that on me– to the contrary, they encouraged my interest in architecture. In fact, throughout high school my standing request for a Christmas present was subscriptions to the two major architectural publications, and my parents honored that request every year. My dad was also very interested in buildings, so he and I would explore buildings together when we took family vacations. Ever since I was a kid, I have always been intrigued by buildings. I love to explore them, and I love to design them. On some level, I have always been architect. At the time I went to college (in the mid-1970s), I was told that just under one third of the licensed architects in the country were graduates of the University of Illinois. Those numbers have changed dramatically since then, as more and more universities started offering architecture degrees, but when I went to school, Illinois was one of the primary places that did. My dad is a Michigan alum, so I know he was disappointed I didn’t go to Michigan. At least I stayed stay in the Big Ten! What is unique about going to college for Architecture? What should a prospective student expect? Know what you are getting yourself into! Architecture is a grueling college curriculum. I had 20 hours per week of required design lab each semester for which I only got 3 academic credits. It’s not that the curriculum is that much more difficult than, say, accounting; it is just very time intensive, and that rigor weeds out who really wants to be an architect and who does not. My freshman class started with over 320 architecture students – we graduated 87. I think that kind of attrition is not something most students expect. This weeding out process was intended to prepare us for the real world. Clients are very demanding, and if you are going to be a successful architect, you had better be prepared to deliver results on time and design buildings that won’t fall down. That’s pretty much the first rule of architecture: Build things that won’t fall down. What is the job market today for architects? There are more options available today, but the job market is just as tough now as it was when I got out of school in the late-1970s. Back then the economy was really bad as a result of the oil embargo. I got a job out of school because I knew a guy who knew a guy. The guy I knew liked me a lot and helped me get my foot in the door with the guy he knew who happened to need people to do some drafting. Of course, I walked in on my first day thinking I was God’s gift to architecture. Within 10 minutes I realized I wasn’t and that my education in the real world was just starting. I was really fortunate; many of my fellow graduates were not as lucky to get jobs. The job market is similar today. Given the current economic conditions, particularly here in Illinois, very few firms are hiring at any significant levels. It’s tough right now. But as I said, there are a lot more options for new graduates today; particularly for those folks with computer and construction industry skills. New graduates with current technology skills are needed; particularly in larger firms. The entry-level architects who have internship experience under their belt have a great advantage over those who don’t. What courses did you take in college that didn’t seem to make sense at the time but have proven valuable? Let’s see – I took 3 hours of microbiology and 3 hours of astronomy, and I haven’t used any of it. However my math classes, particularly, calculus and advanced calculus, have been invaluable, even though at the time I didn’t want to take them because they were hard. They really help me understand how things work and understand things from a structural engineer’s perspective. I’m a design guy and being able to understand things from the structural engineer’s perspective is critically important. So, definitely my math classes. Also, general history and the humanities. I took classes in Greek and Mesopotamian Literature and Mythology. I really enjoyed these classes, but didn’t think they would be that valuable. More recently I have become an avid student of American history. Architecture and history go hand in hand, and a lot of modern architecture has its roots in the structures of ancient Greece and Mesopotamia. So, along with math – history and the humanities! Is a graduate degree required to become an architect? There is a lot of confusion around that question. When I was in school, you could get a 4-year degree, and with three years of experience you could get licensed. Now, you have to get a 5-year professional degree, and a 6-year degree is considered a graduate degree. You are going to have trouble getting licensed in some states if you don’t have a graduate degree, so a graduate degree is almost a given – you have to have it if you are going to pursue the career. I started my career doing drafting for a tiny firm in the suburbs. It certainly wasn’t glamorous, but the guy I worked for really taught me how a building comes together. I learned a lot, but it wasn’t fancy. My long term goal was to design churches, and the premiere architectural firm doing that kind of work was in Rockford, Illinois (another suburb of Chicago); but they weren’t hiring. I remember going into my office to announce that my wife and I were expecting our first child. My announcement was greeted with a lay-off notice! Not the response I was expecting, of course, but a major project had just been completed, and they didn’t have any work. As a result, all of us got laid off. I must have reached out to 80 firms throughout the Chicago-land area via phone, postal mail or foot, including that firm I really wanted to work for. As it turned out, they were looking to open a small Chicago office with two people, and they were interested in me and one of my classmates from Illinois to be that two-person team. That is when my career really took off. I had a design job with an architectural firm specializing in churches, I was working with a former classmate, and I was making enough money to support my wife and growing family. It was a real blessing. After establishing my reputation with that firm, I decided to strike out on my own and in 1986 started my own company. 26 years and 372 projects later, here I am! And, I still love it. What don’t you love about your job? Government mandated paperwork! I spend so much time filling out government forms and paying fees and taxes I never used to have to. It is getting harder and harder to be a small business person. Here’s an example: The building code used nationally used to be about 180 pages long. Nowadays, the building code fills 12 volumes, 300 pages each, and some parts of the code contradict others. The whole code review process has become really cumbersome. Dealing with late payments is not much fun either. They are rare, but they happen occasionally and when they do, the client meetings are usually uncomfortable. This is stuff they don’t teach you in architecture school. What advice do you have for students considering an architecture degree? Work really hard in school – particularly in the area of design – and get a mentor. Your mentor will fill in the gaps in your education for you. Find an architect you admire and ask them to be your mentor. Trust me, they like mentoring. I regularly mentor students at Judson University and I love seeing their passion and creativity. Mentoring gives me great hope for our future! If you really love architecture – pursue it. If you don’t have that passion for architecture, the program will weed you out! If you knew then what you know now . . . Recognize that you don’t know everything and that you will be learning as you go. You will make mistakes. There are times you will be right, but that won’t matter. What matters more is doing the right thing by your clients. In Illinois, there is lawsuit every two years for every licensed architect. With myself and two other licensed architects on staff in my firm, I should be facing a lawsuit every year. I am proud to say that in 26 years – I have never been sued; I’ve never had to set foot in a courtroom! Know this – you will encounter problems during your career, everyone does. How you handle the problems (and opportunities) you face will reveal your character and define your career and reputation. WOW! I really loved reading this! I have no recollection of ever encouraging you to be a minister. There was no doubt in our minds that you would be an architect. I think you were born with a building block in your hand! Love you and are so proud of you and your accomplishments. I liked reading this Dave. Your sister Elizabeth posted on facebook. My middle son is going to graduate with a Construction Management Engineering degree in Dec 2013. He loves working with buildings and working through codes etc. Quite a talent so much more than accounting or finance. Hope things are well in Illinois for you & your family.